Who Need to Be Well-Educated? Scholarship is something that really matter to me, not only because of economic reason; it is matter because Scholarship has been a part of me since the very beginning of my education life. It was 2001, the year when I was just a 9 years old kid who won his first scholarship at the 3rd grade. I fallen in love with scholarship ever since; the story begin. 2012 is a year when I am able to reach one of my dreams. Winning a Fulbright scholarship is something prestigious for me. A chance to study abroad is not merely a scholarship, it is a life-changing experience, a chance to study, a chance to meet new peoples whom become your life-long friends. 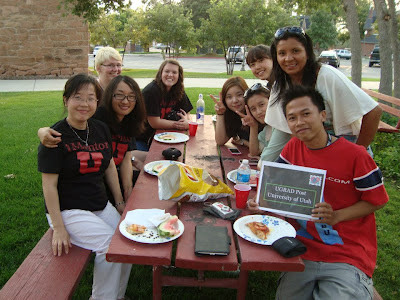 Fulbright gives me an opportunity to study in the United States, the land of opportunities. The first time I arrived, many things haunted me, cultural shocks, home-sickness, the foods, and the weather. But, fortunately it is not scary, it is challenging to me. I learned a lot of new things ever since, and yes I met a lot of new peoples whom I believe will become my life-long friends. For the time being, I still focus on my study here in the States. But I never abandon my hobbies and my extracurricular life. Basketball is my favorite sport here, I also the President of a Model United Nations student group in my campus. But do not get me wrong, those activities not only will bring you a busy day; it is also a chance to learn something new. Education has become one the most interesting thing in my life since I was a little boy. My parents always told me that education is very important since the very beginning of my life. That is way, perhaps my pursuit of education will never end. Nowadays, however, good education becomes more and more unaffordable for most part of the world. Many say that a will to be a well-educated people is not enough if you do not have enough money. This probably most heard in a poor and undeveloped country. Indonesia, however, is not a poor and undeveloped country, but unfortunately it is still a country lacked of good education. However, we still have the chance, the chance to make this nation be more aware of the importance of being well-educated. So, who need to be well-educated? I believe you will figure out your own answer. I Wayan Alit Sudarsana, University of Utah, Salt Lake City, USA. Thanks for your grateful informations, this blogs will be really help for Education scholarship . Terima kasih ya sudah berkunjung. Saya kemarin kuliah di University of Utah.